Yesterday, vegetarian/sometimes vegan Heather from Gluten-Free Cat revealed that she’s now eating meat and feeling much better. I’ve needed to share about the changes in my diet for a while and feel like now is the right time to do that. Early this year, I started having new digestive problems and felt like it was something I was eating. I’d already cut out gluten, dairy and soy. Since I’d had success with my first EnterLab test – they said I shouldn’t eat the three above – I ponied up the money and had another test for 11 more foods: corn, rice, oats, beef, chicken, pork, tuna, almonds, cashews, walnuts, and white potato. All of the grains tested positive but nothing else. I eliminated all grains but continued eating what are often called pseudo-grains – buckwheat, quinoa, tapoica, etc. – and felt much better. Now grain-free I started getting every grain-free or Paleo cookbook I heard of from the library. I happened upon Jenny Lass’ and Jodi Bager’s “Everyday Grain-Free Gourmet.” Jenny’s healing story in the intro startled me because she’d used the Specific Carbohydrate Diet (SCD) to heal from celiac disease when the gluten-free diet hadn’t worked. 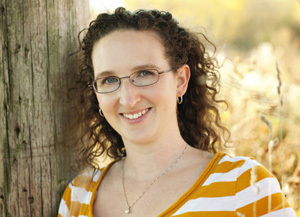 When I interviewed her for the blog, I learned more and became more intrigued by the SCD vs a regular gluten-free diet. I felt better on my “grain-free” diet but the eczema that had faded somewhat returned. I also didn’t have the energy I wanted. Then I had a severe yeast infection with bleeding that told me I needed to do more and heal. Excess yeast needed to be starved out. After checking out and eliminating the candida diet, I looked into the SCD and felt it would help. One month ago, I started it and the eczema cleared up almost immediately. The food seemed peaceful to my body, for lack of a better word. Recently, you’ve seen recipes on here – Apple Pie Pancakes with Cinnamon-Apple Sauce, Carrot Walnut Muffins, No-Sugar Almond Flour Sugar Cookies (without the chocolate), Simple Summer Fruit Crisp, and Spaghetti and Meatballs - that I’ve created to not only fit this diet but to be delicious for everyone. That’s my goal. Everyone gets to eat food that’s good for them and tastes great! My husband still eats a standard gluten-free diet so that may be reflected on here sometimes but you’ll generally see recipes that fit the SCD. He does also need to control his carbs for his blood sugar and the SCD recipes are good for that so he’s been enjoying these recipes too. I’m now enjoying my grain-free life. And hoping to share it with you. *This wasn’t the first time I’d heard of the SCD. My first husband (now deceased) had ulcerative colitis and tried the diet in the late 90s, but stopped it after some months. I went on it with him and felt good initially but not over time. There was a lot of dairy so I think that was most likely the problem. But first, Jenny’s story which some of you may be able to relate to. She grew up as a normal kid with a bit of a touchy stomach. In her mid-20s, severe fatigue and joint pain kicked in. Terrible colds, enough that she cracked a rib from coughing, seemed to be symptoms that her immune system was shutting down. Then diarrhea started and the frequency of trips to the bathroom increased to the point that she stopped going out. She says, “Around Christmas time 1999 things were really going south for me.” About that time, a family friend gave her a copy of the book, “Breaking the Vicious Cycle.” Jenny set the book aside. Her doctor wasn’t able to give answers to her problems but a registered dietician suggested that she might have celiac disease. Jenny says, “She said to try the gluten-free diet and I just got sicker and sicker. It was Christmastime; I thought I can’t go to the doctor.” That’s when she remembered the book she’d been given. “I pulled the book off the shelf and thought I’d try it. I had a simple meal from it and the next day I wasn’t sick. I did my best to follow the diet and literally overnight got my life back. It was as if it was what my body had always wanted to eat.” She switched doctors and her new doctor diagnosed her based on her symptoms which pointed to celiac disease. In this, their second cookbook, Jenny and Jodi repeat some of the foundation recipes from the earlier book such as the yogurt that’s an integral part of the SCD. The cookbook is divided into breakfast, lunch, dinner and dessert. The majority of the recipes are suitable for every day with some – in spite of the title – excellent for entertaining or a special occasion. Jenny says that of the two of them, Jodi is the who tends to write recipes that are “more upscale and fancy” so Jodi’s the creator of the recipes for Warm Pecan Crusted Goat Cheese on Organic Greens and Spinach Gnocchi. Jenny says, ”I tend to do slightly simpler recipes.” She created the Dijon Buns and Sweet Squash Kugel. Jenny, a writer by profession, wrote the fascinating history of the SCD in the beginning of the cookbook. Jodi came up with a brilliant system at the back of the book for mixing and matching the recipes to make meals. I had a question for Jenny about why almond flour is used so much. Why not another nut? She says, “Almonds are very neutral in flavor, walnuts are bitter and quite oily, peanuts or hazelnuts are very strongly flavored, pecans have a slight bitterness. Almonds aren’t quite as oily and take on whatever flavoring you put with it.” That makes sense. Jenny gave me permission to give you the recipe for Glazed Pound Cake. I was shocked when I made it. Even though it’s made with almond flour, it doesn’t have a nutty texture as many almond flour baked goods do. It just tastes like pound cake. She strongly preferred that I use butter in the glaze or use another glaze but I wanted to make it as close as possible to the way it was written and I don’t eat dairy. I substituted Earth Balance Coconut Spread and it was delicious. (I have one additional confession. Instead of letting the cake and glaze cool per the directions, I put the warm glaze on the warm cake and had a slice then. It was yummy warm.) This cake would be a great base for other flavors. I think next time we may add some orange or lemon zest to it. I also think it would be good with spices such as cinnamon and nutmeg. 1. Preheat the over to 300° F (150° C) and line a greased 9 x 5 inch (2-L) loaf paper. 2. Mix the almond flour, baking soda, and salt in a bowl. 3. Add the honey, vanilla, and eggs to the flour mixture and whisk together until combined thoroughly and smooth. 4. Pour the batter into the prepared load pan and bake until a knife comes out clean when inserted, about 40 minutes. 1. Mix all ingredients together in a bowl until the glaze is even in color and texture. It should be runny and a little warm from the melted butter. 1. Place the cooled loaf on a serving plate. Drizzle the glaze over top, allowing it to run down the sides of the loaf. 2. Refrigerate until the glaze is set, at least 1 hour. Thank you Jenny for the wonderful interview! Some additional recipes can be found on their website. Jodi is also the president of the food company Grain-Free JK Gourmet. Danielle shared her story and a bit about her recipes. Q: Please describe how changing your diet changed your health. A: I was diagnosed with Ulcerative Colitis, an autoimmune disease, when I was 22 years old. After a few years of suffering, multiple hospitalizations, and doctors telling me that what I ate wasn’t a factor in my disease, I decided to take matters into my own hands and drastically change my diet. We already ate fairly healthy and stayed away from processed food, but it was clear that big changes needed to be made. It was a gradual process for me and I eliminated things along the way as I learned what my body needed. I started by going off all“white” foods – white sugar, white flour, white rice, potatoes etc. I switched to whole-wheat pastas and flours and used alternative sweeteners. After a few months of doing this and not noticing a difference I went gluten-free, changing our diet again to eliminate wheat and incorporate more brown rice, gluten-free oats, and quinoa. While I wish I could say I’ve been completely healthy and in remission since starting to eat the way I do, I cannot. I do feel much better overall and have have much improved gut function, fewer migraines, less overall stomach upset and higher energy (even with a toddler! ), I feel like I am still learning what the exact combination of diet, supplements, and medications my body still needs, but things have improved so much since I was diagnosed 5 years ago. Q: Do you ever have to give up on a recipe? Is there something you’ve tried and couldn’t figure out? Or do you always keep at it until you do? A: I’m a bit of a perfectionist with a Type-A personality, so giving up feels like failing to me. Stress contributes greatly, though, to my disease, so I have had to work hard at finding a balance in the kitchen. There are some people that de-stress by working out or cleaning the house, but I love creating and perfecting recipes. Things don’t always turn out like I hope they will, and there are definitely recipes that I’ve had to make dozens of times to get it just right. (For instance, my grain-free sandwich bread.) It just feels like such an accomplishment when I’m able to share food with people that I’m truly proud of. I have now amassed a collection of over 125 grain-free recipes and publish two to three new ones a week, so the collection is ever growing! A: Most of my inspiration comes from things that I used to eat, or things that I wish I could order when we go out to eat. I like to try to recreate them so I don’t feel like I’m missing out on anything. And most of the time, I think my rendition is better than the original! There’s just something to be said about real, fresh ingredients rather than the processed things that are so readily accessible to us. I also love perusing food websites and seeing what kind of recipes the general public like to see and pushing myself to see if I can make something that tastes and looks the same. Oh and I love tricking people! 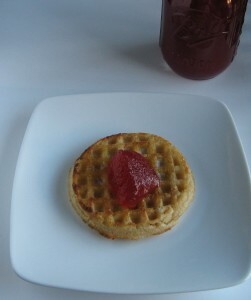 It’s fun serving guests something that they think is an ordinary plate of waffles or chocolate cream pie and then telling them it’s grain-free and dairy-free! Q: You frequently combine almond flour and coconut flour. Do you find this improves the texture or is there another reason? A: I think the biggest problem people on restricted diets face is boredom, and I was getting bored with the flavor and texture of almond flour. That’s why you have seen a lot of recipes using both coconut and almond flours, or some without almond flour at all. I was never happy with the slightly soggy consistency a lot of almond flour recipes seem to produce, and the ones with solely coconut flour had too much of an egg taste for me. I still have quite a few recipes using only almond flour (my Almond Flour Zucchini Bread is one of my favorites) but I think that coconut and almond are a match made in heaven. The almond flour seems to add the texture and substance of a grain while the coconut flour helps to soak up the extra fat and liquid the almond flour produces, making them a little more lightly and fluffy. And I love that it doesn’t taste like coconut, because I surprisingly don’t really like the taste! I also like the calorie and fat ratio that you get when you combine them. A lot of people forget that while almonds are extremely healthy, they still have a lot of calories in them. Eating an almond flour muffin is much higher in calories than other flours, so subbing in the coconut flour for some of it helps reduce that and also adds a healthy serving of fiber. Q: What do you enjoy most about having a blog? A: I started my blog about three years ago after going off grains and feeling like there was a lack of recipes out there for the lifestyle. I was enjoying experimenting with all of my new ingredients like almond and coconut flour, and wanted to share what I was learning with others like me. My main goal is to provide recipes to those on a restricted diet and leave them feeling satisfied and happy rather than deprived. And, now that I’m a mom, I love sharing stories about my life with my son as well. It’s a great outlet and hobby for me after spending an entire day chasing him around! I would have to say the most rewarding part about running the blog is the feedback from my readers. It makes my day when I get a comment that someone liked something or even just the simple comments thanking me for what I do. I find so much joy in creating the recipes and sharing them, so it’s so nice to hear that I’ve brought joy to someone else’s kitchen or dinner table. I also feel like I’ve taken a really negative situation such as having a life-long disease and spun it to be a positive one, where I am able to help others that are suffering work towards the road to health. I receive multiple emails a week from young women my age who struggle with Crohn’s, Celiac, or UC that are just looking for someone like them to talk to and let them know that life isn’t over, that they can still enjoy food, or the biggest one: that they can likely still have children. I scoured the internet for hours upon hours when I was first diagnosed and emailed people much like the emails I’m receiving now. I just never realized that my story would impact people, particularly women my age. Thank you Danielle for sharing your story and your time with us! I found quite a few recipes on Danielle’s site that I wanted to make. I really wanted to make her new bread but didn’t have enough cashew butter (an order is on its way) so it will have to wait. I’m so glad I chose to make the recipe I did. Without exaggerating, this is the best almond flour baked good I’ve ever made. I’ve had many that I enjoyed but Danielle somehow made these taste like regular flour, not almond flour. The amounts of cinnamon and nutmeg are perfect. I made the recipe as muffins and we had them with breakfast. Dominick Cura was diagnosed with celiac disease when he was nine. No pity party for this kid though. Now 13, he has a blog - Eternally Gluten-Free - and recently published a cookbook with the same name. Creating recipes is a big committment at any age so, as soon as I read about his cookbook, I knew I had to give his recipes a try and let you know how they were. What’s your favorite recipe from your cookbook? I have favorite recipes for all sorts of stuff. Red Velvet Cupcakes are one of my favorites because of the amazing color. Tres Leches Cake is my favorite for its taste. 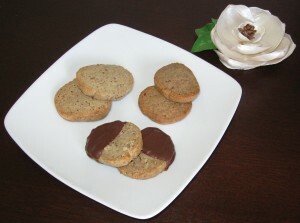 Then my favorite easy recipe is my Nutty Almond Cookies because they’re no-bake and they taste really good. My favorite difficult recipe is Struffoli, an Italian dessert that is fried balls of dough the size of marbles that are dipped in honey, formed into a dome and then showered with colorful sprinkles. Which recipe did you have to work on most to get it just right? There were lots of recipes that I just couldn’t get right and so I couldn’t put them in my book, but other than those my Ricotta cheese cake, because there were so many little things I couldn’t get right that were important. Some people believe writing a cookbook is easy but it takes a lot of work and commitment. What was the hardest part about writing a cookbook and the best thing about writing it? It is really hard writing a cookbook. There was a lot of hard stuff about it. I think the main thing that was the hardest was how anxious I was to get the cookbook done. Another hard part was making the recipes, because there were a lot of times where I completely messed up a recipe and it gets really devastating and discouraging, but I knew I can’t stop baking so I just had to keep trying. The best part, is the cooking! I guess also a good part is the results after the book is published, like the happiness of publishing it and stuff! This is a cookbook of sweet treats – the book’s full title is “Eternally Gluten-Free: A Cookbook of Sweets and Inspiration, From a Teen!” It’s obvious that Dominick loves sweets. I’d never seen anyone add sugar to a milkshake before him. Most of us miss our usual sweets when we start eating gluten-free so here’s a nice place to begin making them. He uses mostly brown and white rice flour along with tapioca flour which are all fairly inexpensive and easy to find. The only negative I saw was that his directions don’t have as much detail as you will find in some cookbooks but, with that said, it wasn’t a problem for me. Wanting to give his cookbook a fair test, I tried three of his recipes. I took the first two to a church picnic and served the third at a family dinner. Ok, these were great. You need to try them. They’re a no-bake cookie so perfect for this time of year. The good news is that this recipe is also on his blog. (Click here) He says to use “slightly crushed pecans.” I gave my pecan halves a quick whir in the food processor. My 13-year-old nephew’s eyes lit up when I told him the cheesecake he was about to eat was from a cookbook written by a boy the same age as him. Everyone enjoyed the flavor in Dominick’s cheesecake. The density of the cheesecake was perfect. You do need to know that cheesecake made from ricotta cheese has more texture than cheesecake made from cream cheese. When I made mine, I substituted a cookie crust for his cracker crust and probably shouldn’t have because my crust came out a bit soggy. (Tip: He told me he uses Glutino crackers for his crust so that’s probably the way to go.) I also skipped pushing the ricotta through a strainer and threw everything in the food processor. I think this is a cookbook worth owning and especially good for anyone who has a gluten-free kid about Dominick’s age. He has an excellent attitude about gluten-free life and is a good example. Her experiences with food allergies began when her first baby was small. His severe eczema – she had to put him in a long sleeved shirt and sew the sleeves shut so he couldn’t scratch himself and bleed while sleeping – led to a diagnosis of tree nuts, egg and dairy allergies while she was still nursing. This vegetarian overnight became a vegan for her child’s sake. Her baking recipes are different than those you’ll see in most gluten-free cookbooks; they all use oat flour - with a note at the bottom if a gluten-free flour blend will also work – instead of the many flours you’ll often see listed. This is also part of Kim’s welcoming philosophy. “A grandmother’s not going to make a $30 cookie. There’s a need for the grandmother who has to do gluten-free when her grandchild comes over but doesn’t cook that way all the time.” Kim’s plan is that she buy gluten-free oats, grind that into flour and bake with it instead of buying specialty flours. “And, grandma can make oatmeal with those oats and there’s no waste.” When a recipe does say it can be made with a gluten-free flour blend, Kim’s tested it with both with bean-based and rice-based flours. I made Italian Hummus from her cookbook and I have to say it’s one of the best that I’ve ever had. (And I really like hummus.) It’s made with cannellini beans so a bit different than the usual but very creamy. I had some friends taste test it and they all enjoyed it. Kim gave me permission to post the recipe here. Soak sun-dried toatoes in boiling water for 10 minutes. Drain and rinse cannellini beans. Combine all ingredients in a food processor. Blend until smooth. I used no-salt beans so added a pinch of salt. I also used regular black pepper instead of white pepper. As a tip: if your garlic cloves are oversized, as mine were, use less. The contest is closed. Congratulations to Jasmine W., the winner of Kim Lutz’s cookbook! Enter by Thursday, June 28, at midnight Central to win a copy of Kim’s cookbook, Welcoming Kitchen. To enter, leave a comment giving your favorite food today. (No allergens that have to be avoided. I can’t say Krispy Kreme.) For a second entry, subscribe via email to my blog and leave a comment saying so. You can also follow me on Facebook and twitter for additional entries but please post once for each saying you’ve done that. I’ll announce the winner on the June 29. Winners must live in the United States or have a U.S. mailing address. 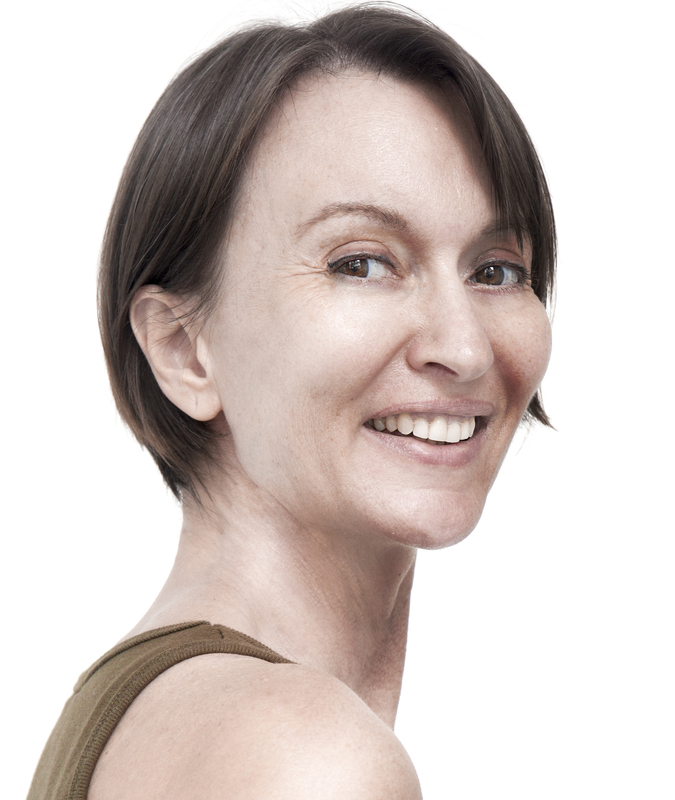 Many of us can relate to Naomi Poe’s feelings as she tried combining gluten-free flours, hoping to hit upon something that tasted good and worked well in recipes. With two sons who had to eat gluten-free – one greatly helped with autism through the diet - she had a lot of practice in a gluten-free kitchen. Then both she and her husband learned they also had to eat gluten-free so that meant more experimenting with flours and more attempts at tasty baked goods. One night, frustrated, she prayed for an answer, then went to bed. During the night, she had a dream about the mix of flours she put together the next morning and Better Batter resulted, a cup for cup substitute for all-purpose white flour. Just six years later, her inspired mix is on track for $1.5 million in sales in 2012. For the flour mix, Naomi tested 14 brands of rice flour in her pursuit of the right one. She chose one that’s U.S. grown and ground for two reasons: she likes supporting U.S. businesses and was also concerned about heavy metal contamination with rice flours out of Asia. You’re probably wondering, as I did, can I actually substitute this cup for cup in any recipe? Naomi says, “Every so often just to make sure, we’ll go to a random yard sale and buy a cookbook, take it home and make 10 or 12 things out of it out of the flour and we don’t have any issues.” If a recipe calls for resting or refrigeration before baking, she advises against it because the xanthan gum in the mix makes it get thicker over time. Important Tip: To meaure the mix properly – and have the recipe come out right, you must spoon the flour into the measuring cup then level it with a knife. Ask me how I know about the tip above. You see, I made some red velvet cupcakes using a Gluten Free on a Shoestring recipe. They had perfect rounded tops when they came out of the oven. Then they fell while cooling. My husband (my sweets expert) pronounced them tasty but more dense like a brownie. I topped them – re-dubbed red velvet brownies – with cream cheese frosting and they were all eaten. Considering the experience Nicole Hunn of Gluten Free on a Shoestring has with Better Batter, I suspected I’d done something wrong. My conclusion: I didn’t measure my flour properly so the amount I used wasn’t what was called for. The topping is the same. My husband says these were perfect except that the garlic was a little light so you may want a pinch more. We all know that taking care of three kids is a busy job; turn that into a gluten-free home and life gets more interesting. 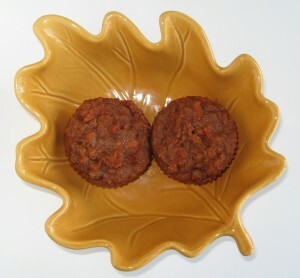 Linda Etherton’s blog, glutenfreehomemaker.com, has been a favorite stop of mine for a long time. She offers up real recipes with foods you’ll find at your local grocery store, with the exception of some of the gluten-free flours. Linda’s boys are almost grown: one’s in college, another’s going this fall – both attending a nearby university but living at home – and a third’s just a few years from college. Her oldest son is gluten intolerant and she has celiac disease so this is a woman who knows gluten-free. 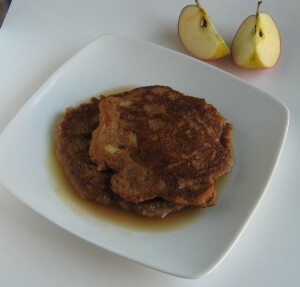 I had Linda’s Almond Meal Pancakes for breakfast (see photo below) and enjoyed the touch of cinnamon she added. You were diagnosed 12 years ago. How has your diet evolved during these years? I started out eating very basic meals with meat, potatoes or rice, and vegetables. I cooked a whole chicken and vegetables in the crock pot and made instant mashed potatoes once a week for a number of months as my body healed and I was learning the ropes of the diet. The only reason I used instant potatoes was that I was still very weak from lack of nutrients due to my intestinal damage. I soon branched out and began trying different types of gluten-free pasta. The choices back then were not as good, but there were choices and spaghetti was another easy meal. Once I got my strength back, I was eager to begin baking and finding gluten-free versions of our favorite muffins, cakes and cookies. I have almost always made gluten-free birthday cakes for my kids because I will not bake with wheat flour. Both my kids and their friends have always enjoyed the cakes. I used to make a lot of casseroles which used creamed soups. I wasn’t sure what to do when I couldn’t eat those soups any more. Then I discovered Mexican casseroles which were a whole new thing for my family and everyone liked them. I also learned to make creamed soup from scratch which is better than store bought anyway. However, once I stopped being so dependent on it, I didn’t use it as much anyway. In many ways I learned to cook all over again, only this time I was paying more attention to the ingredients in the foods I ate, and I was motivated to be creative. You say that everything you cook or bake is gluten-free. You’re the only celiac and one son is gluten intolerant. How do you make gluten-free food work for the rest of your family? My kids were young when I started eating gluten free. I served them gluten-free pasta and that was their only choice, so they got used to it. The pasta also got better. I serve it to guests now too, and while they notice a difference, they think it is good. As for the other food I cook or bake, I won’t settle for food that doesn’t taste good. I have my failures when I’m experimenting, but anything that is a regular part of our menu tastes good. My kids all agree and so do friends and family. Sometimes the gluten eaters in the family are jealous when I reserve certain foods for me and my gluten-free son. You also bring in regular products for everyone but you and and your son. How do you separate gluten-free and gluten in your home? My kids learned quickly that crumbs make Mom sick. The main cooking area of my kitchen is gluten free. Gluten containing foods are stored in a portable cabinet in the eat in part of the kitchen. Any sandwiches are prepared there. In a previous house where the kitchen was smaller, the gluten food was kept in the dining room. The refrigerator is mostly gluten free. Anything that is not gluten-free, my gluten-free son is old enough to know that it’s not for him. We do have separate condiments. The gluten-free jars and bottles are labeled GF. What is your favorite gluten-free meal? Honestly, I really enjoy pizza. Now that I am cow dairy free (my gluten free son is too), I use either Daiya cheese substitute or goat cheese. It’s still one of my favorite foods. While my homemade gluten-free pizza is different than wheat flour pizza, it is still very good, and all my guys enjoy it. It’s one of those foods where the gluten eaters wish they could have the leftovers, but they are reserved for the gluten-free eaters. These were tasty slathered in butter (actually Earth Balance Coconut Spread) and real maple syrup for today’s breakfast and, the good news is, I have enough left over for tomorrow’s breakfast. I skipped the sugar in the recipe, as I often do, so I could drench the pancakes with syrup and have a clear conscience For those new to almond flour, I find it a hearty texture somewhere between cornmeal and whole wheat. If you aren’t cooking these in a non-stick pan, as I did not, make sure you generously oil the pan because almond flour can stick. To help others avoid going down the same path, Kim and her friend Robert created “Let’s Eat Out with Celiac/Coeliac & Food Allergies!” The seven-time award-winning book gives an overview of dining out then goes through various types of foods: steak & seafood, Chinese, French, Indian, Italian, Mexican, and Thai. Common dishes in each are detailed. A hamburger might have bread crumbs in the patty, dairy from the oil or soy from seasonings. Indian Papadam will probably be made of chickpea or lentil flour but could have wheat or corn flour, be fried in peanut oil or have a yogurt sauce. Mini books take the information and make it more portable with books in different cuisines and there is a Multi-Lingual Phrase Passport which explains how to say things like dairy-free, honey and I am having an allergic reaction in four European languages. They have free gluten free ”Chef Cards” in 12 languages and allergen free cards in 10 to print out. When Kim and Robert wrote their book, she says, “We wanted to be sure you could use this eating out around the corner, in another city or another country.” They wanted you to know the questions to ask about the food, and they wanted you to be able to speak the language of the restaurant staff. Thank you Kim for the interview, the books, and for working to make life easier for us.